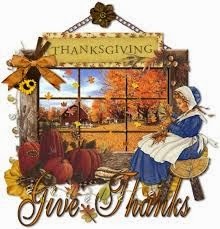 Country Roads By Joanie: Happy Thanksgiving! Wishing everyone a happy and bountiful Thanksgiving. A big Thank You and God's blessing to all those who aren't able to spend the holiday with friends and loved ones because they hold a position that requires them to be elsewhere, caring for others or protecting our freedom. May all be safe at days end.